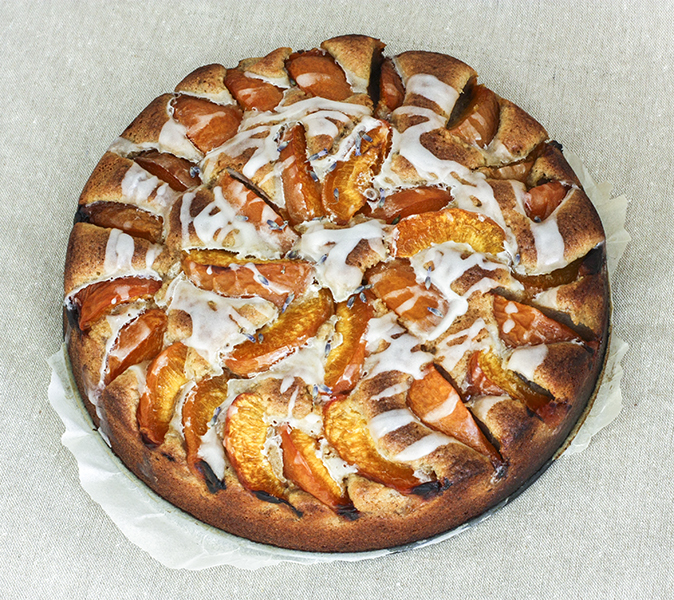 It’s nice to have a few great cakes recipes up your sleeve, isn’t it? And although a classic Victoria sponge remains one of my favourites (with tart plum jam in the middle and a sprinkle of caster sugar on top), I am also keen to find new favourites. 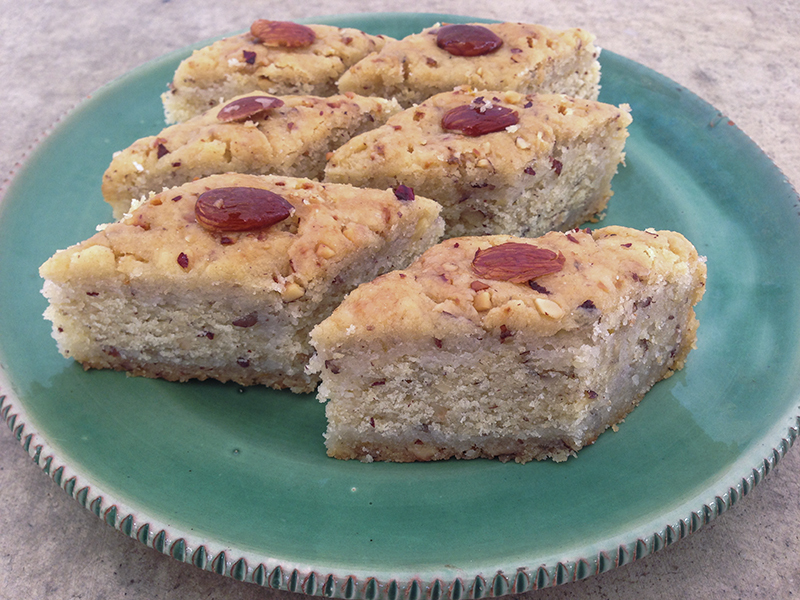 Inspired by Ottolenghi, here are my takes on two of his recipes: Fenugreek Cake and Apricot, Lavender and Walnut Cake. This is a delicious cake. 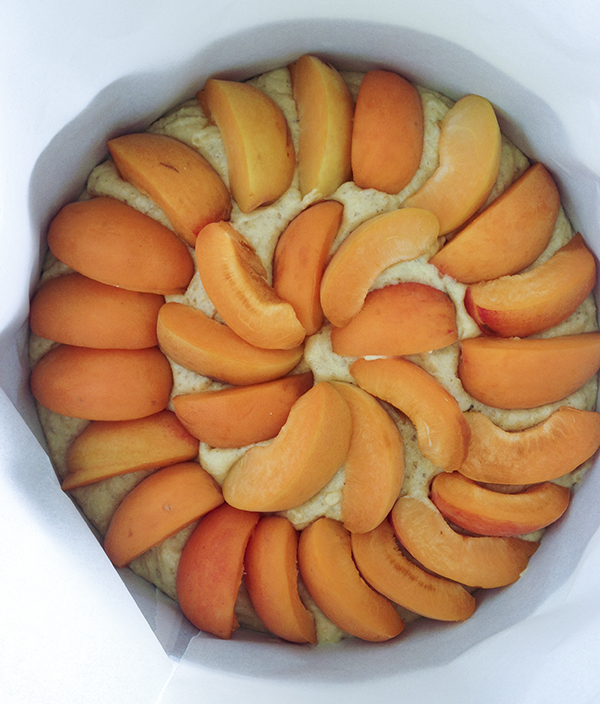 I have tried it with apricots and then again with peaches, and both work extremely well. If you can’t find fresh lavender you could miss it out – it does add a subtle flavour though and a pretty blue/purple tinge to the cake decoration. Put the butter, oil, sugar and ground almonds into a mixing bowl and beat until light and fluffy. Add the eggs slowly one at a time and mix well. Add a spinkle of the flour if the mixture looks like it is splitting. Add the rest of the flour, walnuts, vanilla, lemon zest, lavender and salt. Fold them in using a metal spoon (to keep the lightness you have created by beating the butter mix). Halve the fruit and take the stones out. Grease and line a 23cm cake tin. Pour in the mixture and lay the fruit tightly against each other on top, skin side down. Bake for an hour and 15 minutes. You want to the top to be well browned, but if it starts going too dark, put a piece of baking paper or foil over the top. 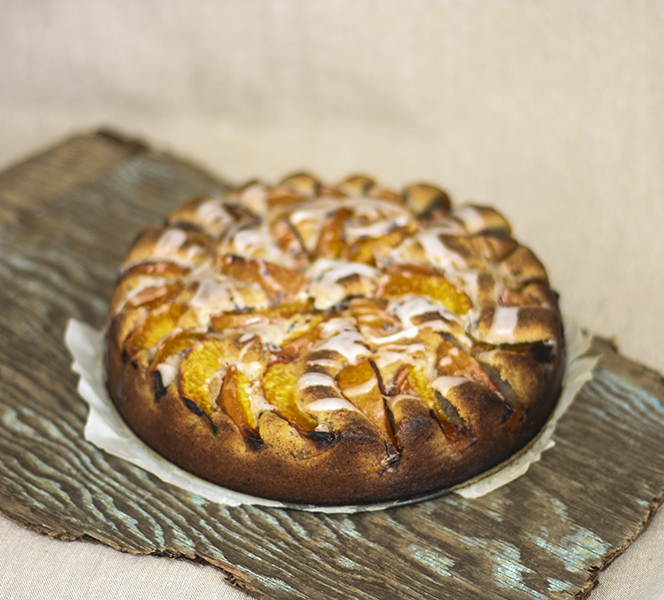 When the cake comes out of the oven, mix the lemon juice and icing sugar together and drizzle on top. 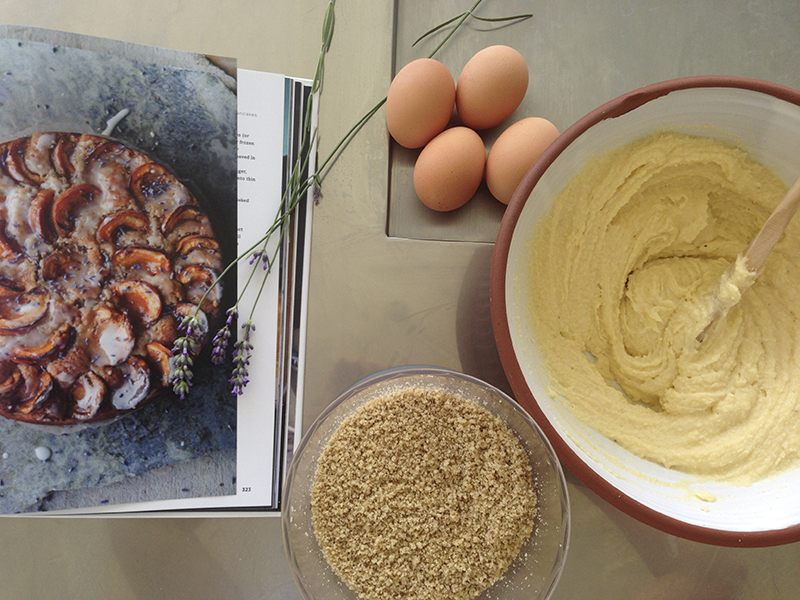 Sprinkle the lavender and the cake is ready to be eaten (once it cools down a bit). 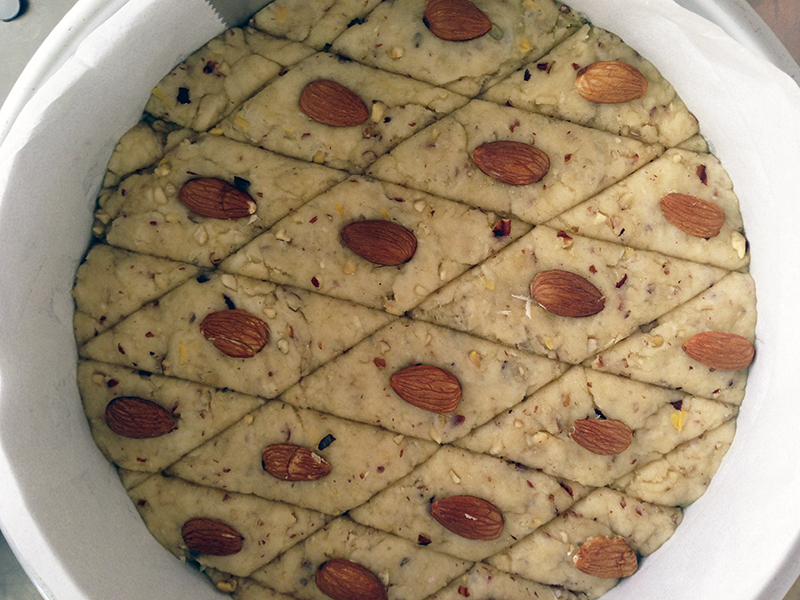 This is a cake made with semolina and flour, flavoured with fenugreek and then soaked in syrup. 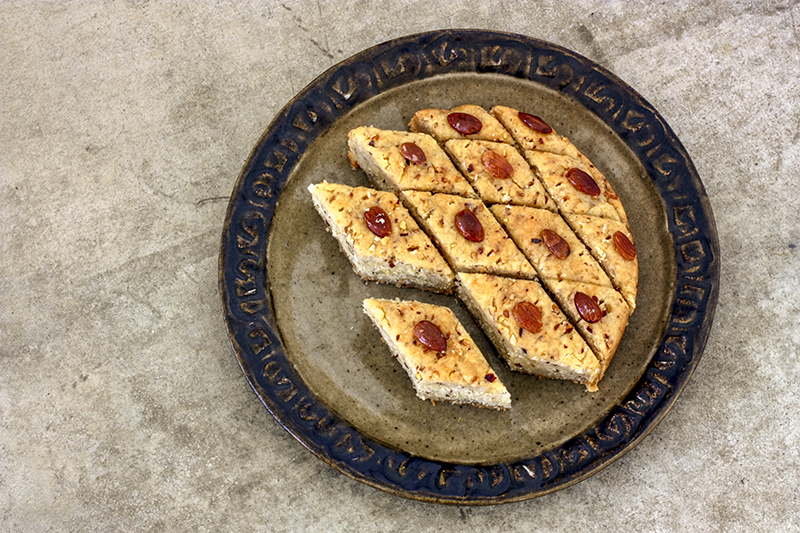 If you like those sweet Greek and Turkish pastries like Baklava, you will like this. Note: I think it would be easy to make this cake dairy-free; just miss out the butter and add a little bit more oil… (I have taste-tested this variatioin yet). Add a few tablespoons of warm water to the yeast to wake it up. Put the fenugreek seeds in a pan with 600ml of boiling water. Simmer them for half an hour until the seeds are plump and the water has gone yellow. Drain the seeds, but keep the water; you need some of it in the cake later. Blitz the nuts up to a crumb-like consistency with a blender, then put them in a big mixing bowl with the semolina and plain flour. Add the oil and butter and stir well. 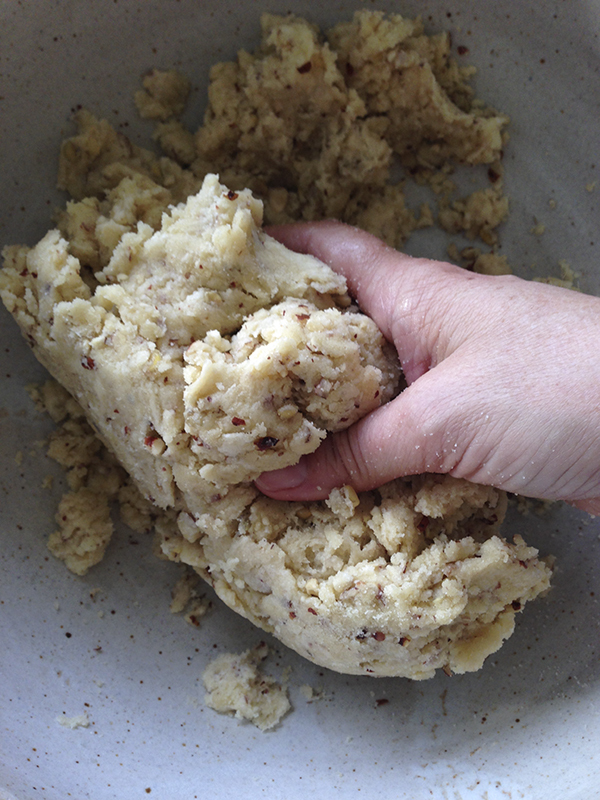 Add the seeds to the nuts/semolina/flour mixture, then add the yeast, baking powder and salt. 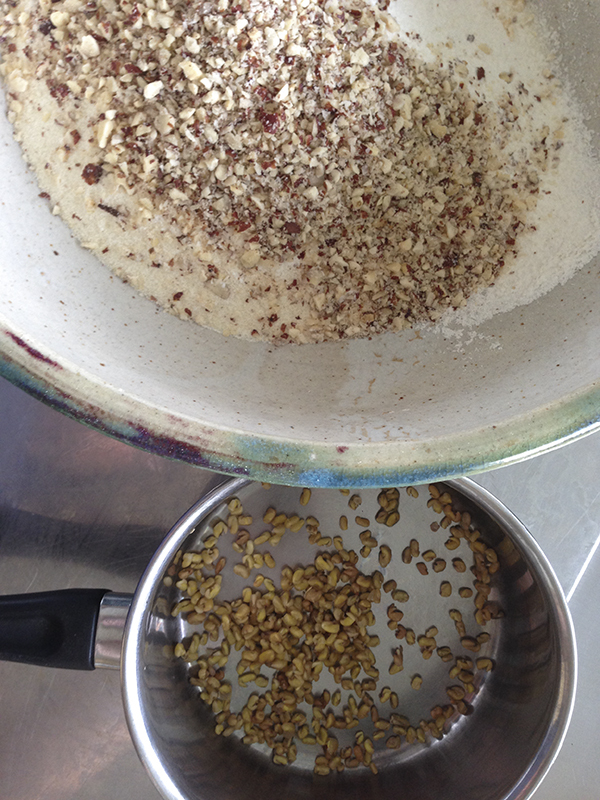 Stir in 180ml of the fenugreek water, and start bringing the mixture together to form a dough. When well mixed, put the dough into the cake tin and push it down with your fingers or the back of a spoon to flatten it out. Score the top of the cake with a diamond pattern and put the cake to rise somewhere warm with a clean tea towel over it. Bake it for 20 minutes, then turn the oven down to 200°C and cook it for another 20 minutes. It should be golden brown and a skewer should come out clean when you stick it in into the middle of the cake. Put the sugar and water in a pan and heat, stirring until the sugar has dissolved. Add the lemon juice, then take off the heat and cool. Add the flower waters and then pour all over the cake. Leave the cake to cool and the syrup to soak in… once cool, wrap in foil or baking paper and try to wait overnight before you eat it. If you make these recipes, snap a photo and hashtag #coromandelflavour – I love to see what you’ve been making and any feedback is really welcome.